Offering free Wi-Fi and local calls a continental breakfast and rooms with microwaves and mini-fridges America's Best Value Inn & Suites Moss Point also sits in a location with easy access to I-10 and Pascagoula beaches. The three-story America's Best Value Inn offers 50 air-conditioned rooms with cable TVs including HBO free local calls microwaves and mini-fridges. Check your email or update your status with free Wi-Fi. The hotel serves a continental breakfast and has a guest laundry. It also provides fax services. Pets are welcome. Non-smoking rooms are available as is parking. The hotel is located off I-10 fewer than 10 miles from Pascagoula Beach Park where you can splash in the welcoming Gulf Shore waters. Catch an airboat ride 10 minutes from the hotel. It's 15 minutes to Mississippi National Golf Course. The University of South Mississippi is 20 minutes away and it's 20 miles to Biloxi's casinos. 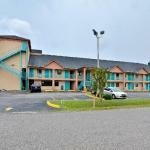 The hotel is four miles from Trent Lott International Airport.